Sal Khan and his traveling team of six teachers and developers from Khan Academy are on campus at Phillips Academy this morning. We are delighted to welcome them to a special faculty meeting. We are pleased to welcome friends from the Andover public schools ( Superintendent Marinel McGrath and AHS Principal Christopher Lord), the Lawrence public schools, and the Pike School as well. Sal tells the story of being a hedge fund analyst who began by making short videos to help teach a young family member, a cousin in Louisiana who was having a hard time with unit conversions (gallons to ounces). They worked together on mathematics tutoring by speakerphone and Yahoo! Instant Messenger. That grew into videos and exercises. Today, there have been 85 million users to date. 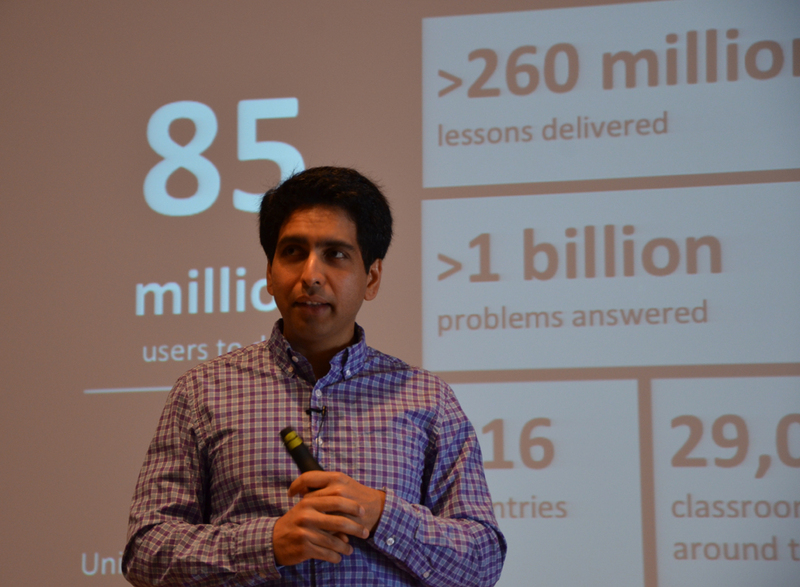 Each month, there are 6 million unique users on the Khan Academy site. In total, there have been 260 million lessons delivered and over 1 billion problems answered on the related exercises. This year, we have been exploring the professional development theme of Connected Learning at Phillips Academy. We’ve heard from Mimi Ito, Katie Salen, a group working on the Amplify tablet, and others. Sal Khan has already been most generous with us, joining a class I taught in winter (on hacking) by Skype and also Skyping with a group of faculty and administrators in preparation for this visit. Sal and his team are here at a special faculty meeting, the last in this series for the year, and then will be with a class of students in chemistry and a class of students in math. The day will end with what I expect may be a mob of students in the Mural Room of our dining hall, Paresky Commons. At a minimum, it is fascinating to hear his story first hand. The narrative of Ann Doerr sending first a $10,000 check, then meeting him at an Indian buffet, then sending a $100,000 wire is a great Silicon Valley tale of entrepreneurship and the importance of foresight and angel capital. There’s then the chapter of Bill Gates and Walter Isaacson on stage at the Aspen Ideas Festival talking about “this new site” Khan Academy. I am a fan of Sal’s new book, The One World School House, and have used his videos and exercises in classes that I’ve taught and with my own kids to help explain topics that I don’t know much about. We are exploring more than the minimum. Could we imagine what would happen if Phillips Academy teachers and students were working in real partnership with Khan Academy? As they develop the interactive side of Khan Academy, and especially assessments in fields like math and science (and many more), we might be able to help. As Sal tells us, the videos are helpful, but they are not the focal point — that should be the problem-solving, the exercises, the interaction. At Phillips Academy, our faculty has been at this teaching-and-learning thing for 235 years; the faculty members are not that old, but as a group, are deeply experienced and at the top of their game. They teach in a range of fields that is much broader than what is currently offered, well anyway, through the web — mostly, in the arts and humanities, which have not been the focus in the digitally-mediated education world (yet). The faculty at Phillips Academy (and, I suspect, our peer schools here in the Merrimack Valley of Massachusetts) also know that we don’t know everything. And there’s a very positive sense that we need to keep learning and exploring new modes of teaching. Sal Khan and his team certainly know some things we don’t about reaching lots of people through their digital teaching methods. Questions from the faculty and students ranged from math and science teachers asking hard questions about what the implications of these forms of teaching might be to humanities and arts teachers asking if there is any implication of this type of learning for their fields. It’s plain that a great, rich education — at any level — is about many different forms of learning in many different fields, including language, culture, music, visual arts, athletics, and so forth. 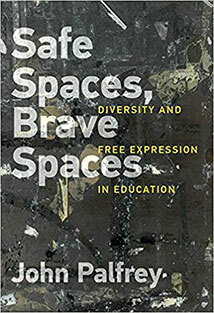 A great education has a lot to do with the face-to-face experience of students and adults in the same physical spaces. We are talking today about what truly blended and connected learning might look like — taking advantage of the best of residential education and the best of digitally-mediated experiences, and mitigating the problems/limitations associated with both. Even those of us who are the most enthusiastic about the reach and implications of the digital revolution for education — and I count myself in that number — should recognize the value of the residential, the social-emotional, the expressive, the experiential, and many other aspects of learning that are (today, anyway) experienced in the analog world. Sal also offers advice for students in what he calls “big brother” mode. We are discussing what impresses Sal and his colleagues when they are hiring new staff: they are impressed by what students have *made*. “The more artifacts that you can create over the course of your life,” Sal said, “the better off you’ll be when it comes to getting hired.” The idea of building a digital portfolio, badging, and other artifact-creation (how about a painting?) is one way to respond to this challenge. Another bit of advice from Sal: don’t think of “test prep” as a dirty word. Consider it a chance to master the skills and information that matter in the course of your education. It’s an exciting moment in education. At Phillips Academy, we are devoted to seizing it. This session in our auditorium and classrooms this morning is a great starting point. It’s an electric morning here in Andover.